Early summer drought had the lake down 2 feet. This eliminated lots of shallow water for anglers to decipher with Lake Eufaula naturally being a shallow lake with expanded flats. It also eliminated a lot of fishable water as well. Anglers expecting to fish there favorite weedbeds in that 1- 3 feet of water had to look elsewhere as summer began. Some places normally shallow at full pool were even hard to get the boat in. What many anglers fail to recognize is that many bass are heading for the security of thick, shallow cover or the comfort of deep water for the summer. They are not stacked up in the shallows like a few months back, when bedding bass were everywhere and post spawn activity had bass blasting topwater lures on every cast. Don’t get me wrong, there are some bass that do remain in shallow water year round on Lake Eufaula. There are also some very catchable bass in what shallow water cover that now currently exists with the lake level unseasonably low. Lake Eufaula still has lots of aquatic weeds for bass to seek shelter in. Wood cover and rock cover can still be found lake wide. So as water temps heat up bass either seek the shelter and cooler water in the shallows around wood, rock and weed cover or they head for deeper water. 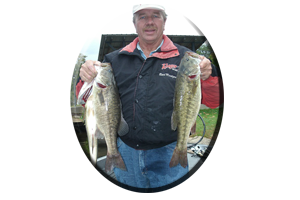 In deep water, schools of bass either suspend at a preferred depth or they are found laying on or near the lakes bottom deep along ledges, drop-offs and any other sudden depth change. Keep in mind, for their comfort these bass are always in cooler water. Moving water or current is best in summer. Like the bass, the summertime bass angler has to search out these favorite, summertime haunts. Finding these likely, summertime holding spots always involves lots of searching and fishing Lake Eufaula from shallow to deep water. Of course this does not come easy. It can get downright frustrating going without a bite for hours while sitting in the hot, midday sun. Patience is needed during the hot, summer months as much as it is when fishing during the dead of winter. Don’t expect a lot of bites after the typical, early morning, crack of dawn, summertime bite ceases. Any bites you do get after sunup, be glad you did. Many anglers often leave Lake Eufaula (early in the day), disappointed in the results of their fishing. Especially discouraged after hearing from anglers from all over the United States about how good of a lake it is. 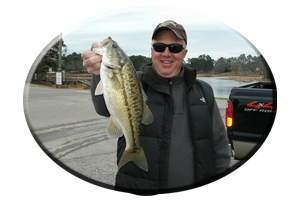 Some anglers travel miles, spending lots of hard earned dollars on preparation, meals, motels, etc., while often visiting the Lake a few days…all in hopes of landing one of Lake Eufaula’s famed, trophy largemouth bass. 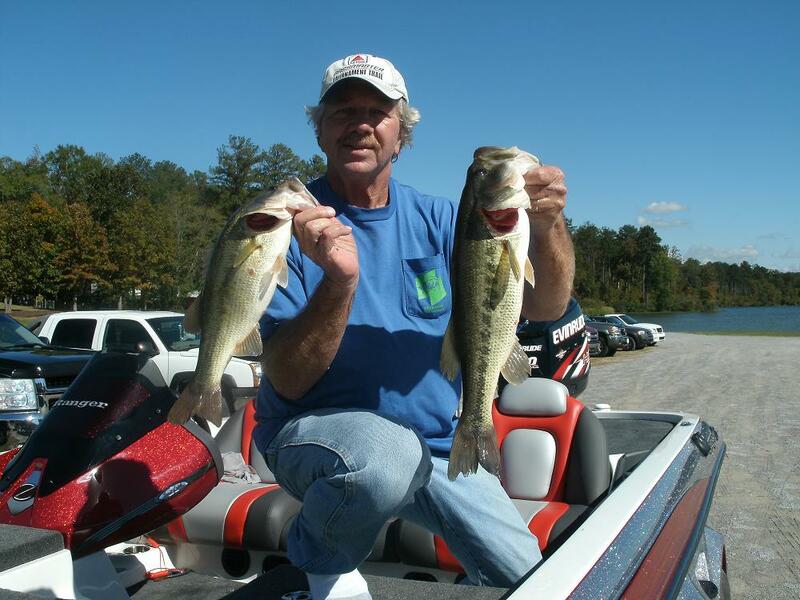 So heres some tips for summertime fishing for largemouth bass on Lake Eufaula this summer. From June – September finding these bass in these likely looking spots will assure their return — when you return them to the water you found them in. Please Practice Catch and Release. Let these bass go (of course after taking a few pictures of them), right where you caught them. Unless you are in a bass tournament there is no reason to ride them all over the lake in that hot livewell, submitting them to unnecessary abuse and often, death. 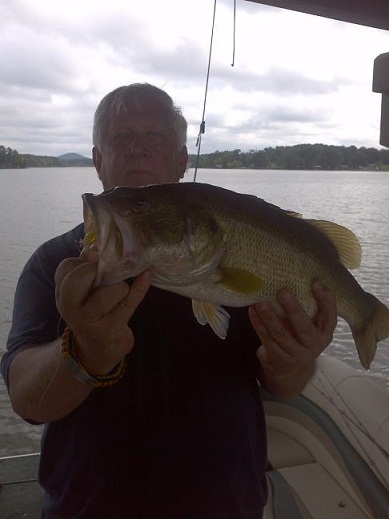 Deep bass on Lake Eufaula can be deep when the temperature soars. They can be found holding along10-30 foot break lines on both creek and main river channel drop-offs. 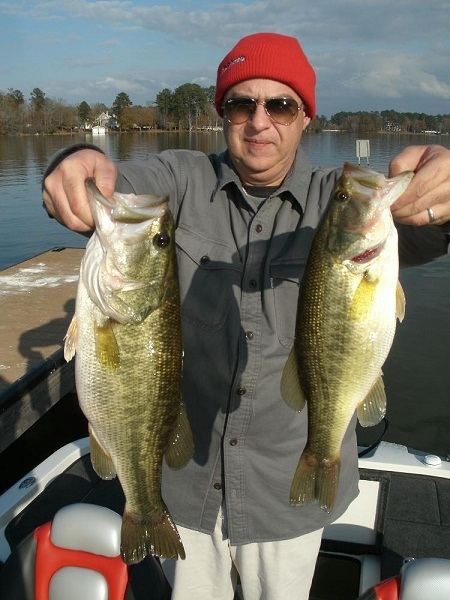 When these deep bass are found, locating them again, means marking the spot on a map or GPS to help you in returning to on later trips. Most deep water bass can be found in the same locations all summer. So having many deep water spots shows moving around on some days, which in turn also cools you down with a boat ride. Having many previously marked deep water locations will help. If you are a first timer to massive, Lake Eufaula you can narrow your search in finding good drop-offs. This simply means fishing around red and green river channel markers or white creek channel markers. These places are always right on the deepest drop. So are fish attractors, brush piles planted and marked by man, which are found lake wide. Rip-rap rocks found around bridges, causeways and the dam are also good day and night. 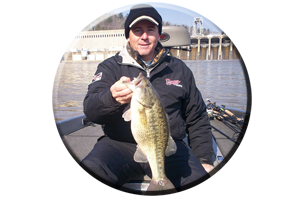 Lures for deep bass can be heavy 1/2 ounce to 2 ounce size spinnerbaits, either slow rolled or dropped along deep drop-offs. Deep diving crankbaits and Carolina rigged lizards or big, 10 inch Texas rigged plastic worms can be fished on 1/4 ounce to 1 ounce sinkers or jig heads. Tube baits, jig combos, crayfish imitations, creature baits or even small, finesse worms will also fool these deep water bass. On cloudy days, late evenings or early mornings bass will even hit topwaters fished on shallow flats that border these drop-offs. Other lures? Rattling lipless lures in the half to 3/4 of an ounce size, shallow to deep diving crankbaits, floating and suspending jerkbaits and even jigging spoons or tailspinners will all work. So having many rods already rigged is advised to give these bass a variety of choices until you see which one works best! 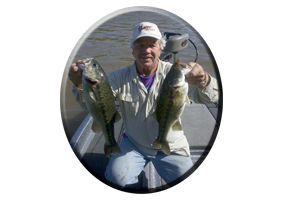 Shallow bass on Lake Eufaula can be caught all day. Or if its just to hot, an angler can fish only the early morning hours, late evenings or at night. If forced to fish during the daylight hours (like tournaments) fishing the lakes many types of aquatic weeds is sure to be in your game plan. Even with Lake Eufaula unseasonably down a few feet for the summer these bass are always in and around some type of weeds still growing in the water. Lilly pads are slowly taking over the entire lake. During the spring an unseasonably warm heat wave showed early Lilly pad growth (in a lake at full pool this past spring) displaying Lilly pads growing everywhere in shallow water. Drought left many of these huge Lilly pads protruding above the waters surface like some open umbrella. They soon whither, turn brown and die in the hot summer sun. But new growing Lilly pads soon show the shallows green and very active as lake levels stabilize and bass move right in under the security of the shade provided by Lake Eufaula’s over sized Lilly pads. Some isolated Lilly pads can grow to over 3 feet in diameter, providing cooler water, shade and security and an oxygen rich environment for these bass and the prey they dine on to relate to. These summertime meals can be many, in and around these Lilly pads, including the many other types of aquatic weeds this massive lake displays. This means having many lure choices for anglers to employ to aid them in fooling these shallow water bass into striking. The list of summertime favorites on bottom are many and the choices can include techniques like flipping, pitching or swimming lures in and around the weeds and Lilly pads. 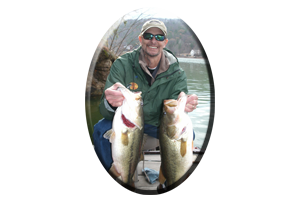 Each style or lure choice varies among each and every angler. Some anglers have success fishing a huge field of Lilly pads by constantly fishing hollow bodied frogs and rats. Those lures featuring a skirt and two upturned hooks or some of the rather new solid bodied plastic frogs in use today featuring only one hook, that actually sound more like a buzzbait when retrieved. Buzzbaits are a close second, along with safety pin type spinnerbaits (or an old favorite still in production today, the Snagless Sally an inline spinner), or the name sake Chatterbait (or the many copies now on the market today), all of which are very weedless and can be retrieved in and around these Lilly pads and weeds. Weedless spoons (in finishes of either gold, silver, smoke black or frog), with an attached pork chunk trailer, plastic chunk trailer or twin tail trailer, are all but forgotten favorites. These weedless spoons, are, “very weedless” and their wobbling action attracts strikes from bass hiding in the weeds. Bass that are not accustomed to seeing these type of old favorite lures…lures that still fool largemouth bass in the weeds on Lake Eufaula today. * NOTE *All of these type lures mentioned should be fished on heavy, monofilament line or one of the new braided lines on the market today. There are some big, strong bass in Lake Eufaula’s weeds. Each lure requires a correct presentation, matched equipment and on some days even the correct lure color can make a difference in whether you get bites or not. Having 10 rods already rigged with fresh line on each reel (all for shallow or deep water applications), can be very time saving while on the water. This provides an angler more time for fishing and less time rigging rods, changing lures and not fishing. Dawn or late evening hours (during the heat of summer), actually only shows about one good hour of fishing and catching. This usually takes place out of 3-4 hours of just casting and not getting a bite. So having a lure in the water can be important during these feeding times when bass are more active. Save rigging time, eating time and other fish ignoring activities for when the bass are not as likely to be biting. A midday break in the shade does wonders.